Easy Blogger Template is another new fresh and super fast theme. This is simple grid style blogger template for every tech blogger. Easy blog is minimalist template and it’s fully responsive theme that is compatible with all mobile devices, so your loyal readers can browser your blog from any device. This theme is most important for better search result. 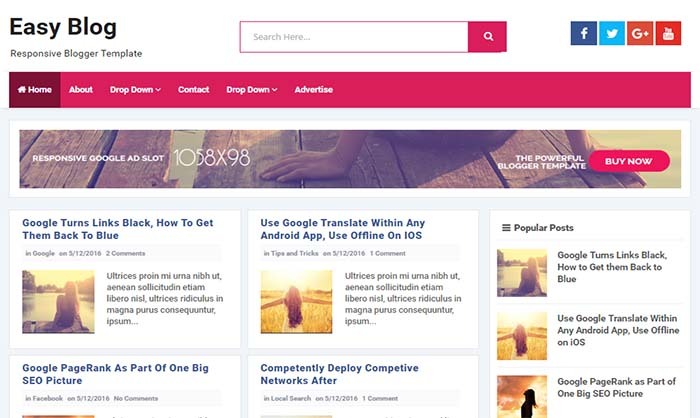 Easy blog is SEO optimized blogger template with up to 100% SEO score. It’s user friendly and SEO ready theme that comes with a lot of advanced features that you ever looking in any free blogger theme.